Many traditional herbal formulas include dates as they are used for balancing the herbal formula, and the Qi and Blood for the body. Likewise, they are also used in cooking to balance the food. On special occasions many people buy quality dates and give these as gifts to their friends and relatives. These dates are red, soft on the outside, with a sweet smell. The inside is soft and moist. They are readily available from a Chinese market or grocer, throughout the year, all around the world. Unfortunately, many people don’t realise the amazing health benefits that Chinese dates have, and therefore, they’re not popular enough in Western food and diet therapy culture. Hopefully, you may be encouraged to include them in your diet, after learning how they can benefit your health. An ancient traditional Chinese book called Ben Jin, along with other Chinese herbal text books all claim that Chinese dates can strengthen the Spleen and Stomach Qi (energy) which helps to digest food, tonify blood and calm the mind. 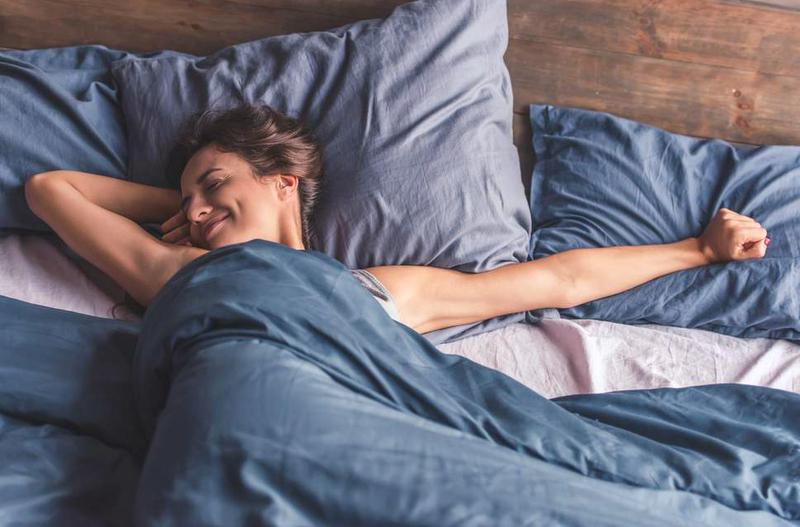 Some people may also suffer from chronic fatigue syndrome, irritable bowel syndrome, under-active thyroid (hypothyroidism), miscarriages or infertility. Balancing the Spleen and Stomach Qi function increases the blood and causes symptoms to subside. If you are currently receiving treatment for the above symptoms, or want to avoid them, add Chinese red dates to your diet. There is a recipe at the end of this article. lack of energy from the beginning of the day. These people may also experience dizziness, lower blood pressure, palpitations, pale skin, and shortness of breath, especially during activities. They may also notice tremoring hands when they become tired. Eating Chinese red dates whilst undergoing treatment, can be very helpful. Modern scientific research confirms what was noted in the traditional Chinese medicine textbooks. 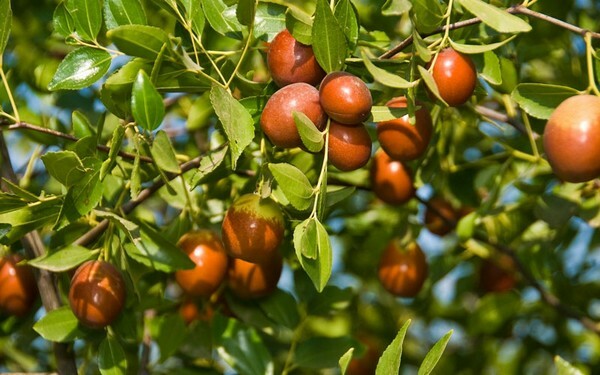 That is, Chinese red dates contain high levels of Vitamin C, as well as having the function of protecting the Liver. They also help reduce cholesterol and increase the body’s immune system, and may help reduce the risk of cancer. Chinese dates can be eaten many ways. You can eat fresh dates as they are, or you can cook them which is very easy to do. 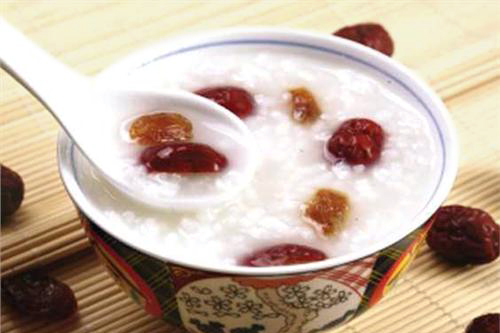 Dates can be cooked with porridge, steamed rice or as a soup. It’s recommended that adults eat five dates in a sitting, three or four times a week for general health care. 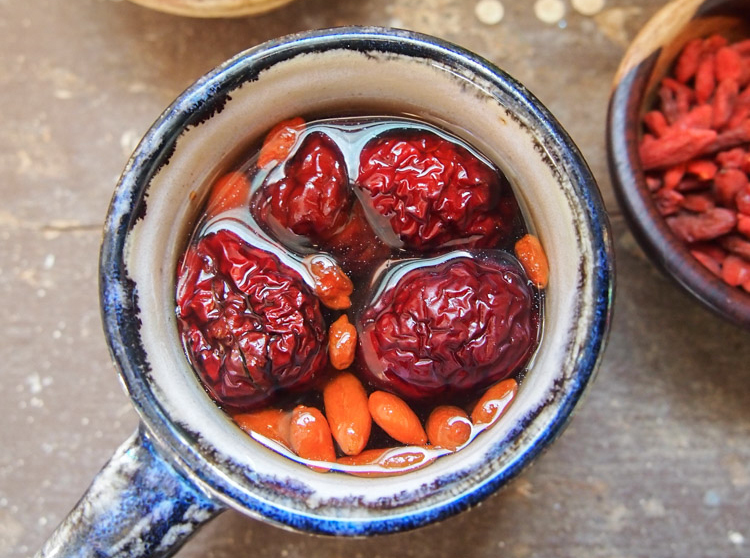 Place the red dates and goji berries into a tea mug, add hot boiling water and steep for 5 minutes. You can refill with hot water a few times. Don’t forget you can eat the red dates and goji berries at the end (watch out for seeds in the red dates). Effects: Tonifies body fluids (Yin) and Blood. Bring the rice and whole dates to the boil and simmer until the rice is soft and the liquid is sticky (around 30 minutes). The porridge will smell very nice and will taste mildly sweet. It is best to eat when warm. 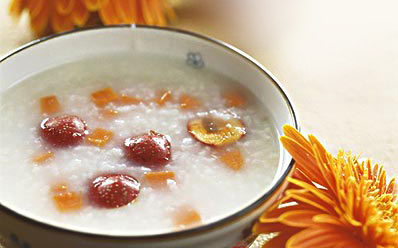 However during summer you can eat the porridge at room temperature. It can be eaten for breakfast or for dessert. Effects: tonifyies Spleen function and increases Blood; helps those with sleeping issues. Add the beef bone to the water and bring to the boil. Reduce heat and cook slowly for 4 hours. 30 minutes before eating, add the Chinese red dates and cook. Add salt and pepper for taste and serve with your favourite vegetables. Effects: Increases energy and Blood; warms the circulation. 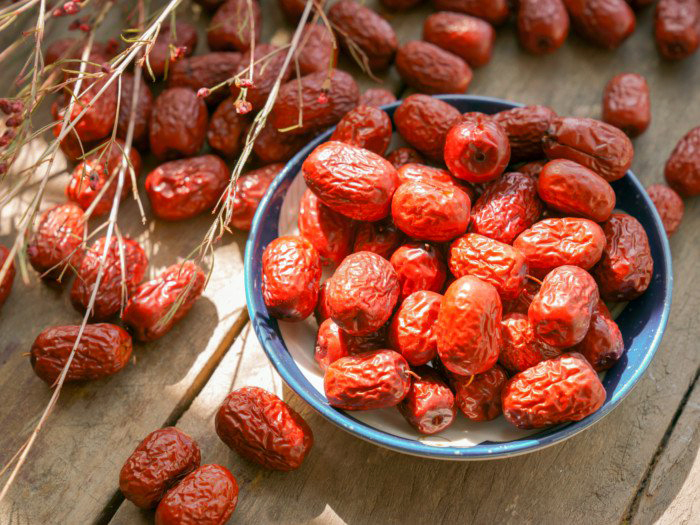 While Chinese red dates can be beneficial, it’s wise to take precautions as they may not be suitable for everyone. If you’re in doubt, please check with your Chinese medicine practitioner. I remember 40 years ago when I lived in the traditional Hutong (street) of Beijing. A lot of the houses there had many date trees and in November which is Autumn, it would be the harvest time for the dates. There were many red dates hanging off the trees, just like red lanterns looking so beautiful. The date trees from different homes each had different tastes, some may be crunchy, soft, sour or sweet, so many children exchanged dates with all their friends to try everyone’s home grown dates. Everyone knew that if they ate too many dates it would cause them to bloat and have diarrhea, so they would only eat 10 dates at most. 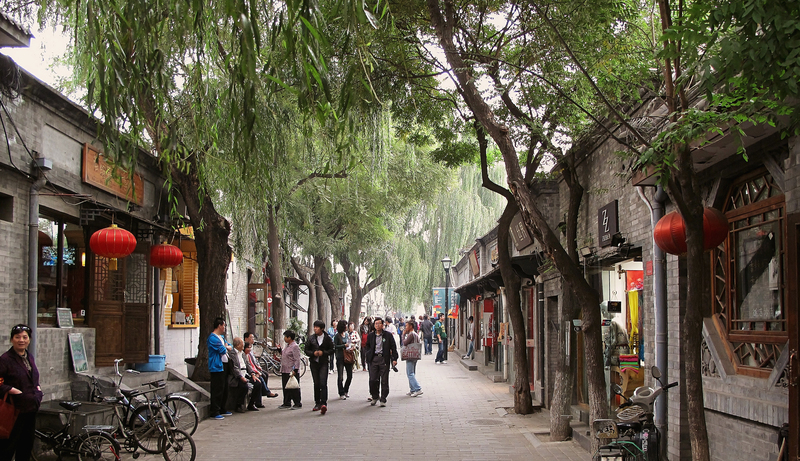 A few years ago, the Hutong street was cleared and changed into a park so there are no longer as many red date trees in the area. But the beautiful image of the date trees are still in my memory. this is news to me. thanks for the great article. I suffer from blood disorder ( thalassaemia) and low qi but now i understand at last that it has been the reason for my tendency to insomnia and light sleep, and ALL the other symptoms you list. I have been taking red date and dang gui tea with ginger for a year and my blood count (red blood cell) went up. Now i will try red date porridge! Yummy! I suffer from a disease called thrombocytosis, which is characterized by high platelet counts; my platelets range from 700 hundred to 900 thousand but i have been as high as 2 million before. They have manage to get it down with a medication called hydrea, which has many bad side effects of which i am very afraid of. Even with the hydrea i have not been able to go lower than 700 thousand. Hydrea makes my stomach burn and this is one of the milder side effects. I constantly live with the threat of stroke with the high platelets and cancer as the side effect of hydrea. What can i do? Thank you for taking my question; grateful Mar. Dear Mar, thank you for your question. Thrombocytosis is not a commonly treated condition by Chinese medicine and there is not enough evidence at this time to recommend that Chinese medicine may be effective. However, Chinese medicine may be able to assist with the side effects of your medication. If you are interested, we suggest you visit an experienced Chinese medicine practitioner who can take a detailed history of your condition and offer further advice. Are these ok for women who get hot flashes? Thanks! Dear Leigh Ann, Chinese red dates are warm in nature. If your body generally feels very warm and you have symptoms of poor digestion (eg. bloating, constipation, reflux) or cough with phlegm, then they may not be suitable for you to eat in large amounts. Thks for the valuable infomation! Yes, we suggest cooking the beef until it is very tender to make it easy to digest. We hope your son enjoys this soup! I’ve been diagnose with low iron, GP given iron supplements. I also have itchy skin rashes behind the neck and on both my legs. I also have a white tongue and constipation. Would the red date porridge be suitable for me? It does sound like red dates may be a suitable food for you to eat. However, if your symptoms don’t improve we suggest you visit an experienced Chinese medicine practitioner for a diagnosis and further advice. Can they consume it during their menses? Dear Rachel, any time is fine if you eat a small amount regularly. Otherwise, the time after your menses finishes is most suitable because it is when you need to replenish the blood you have lost (especially if your menstruation is heavy or longer in duration). I have just undergone a Coronary Bypass Artery Graft operation and the Doctor has given me medicine including “warfarin, Aspirin” for thinning the blood. My question is if I take “Chinese Red Dates”, will the “Chinese Red Dates” collude with my medicine especially the blood thinning. Dear Abdul, there is no known interaction of Chinese red dates with blood thinning medication such as warfarin. Eating Chinese red dates a few times a week should help to improve the quality of your blood. We suggest not eating red dates at the same time you take your medicines. Hi, I have been diagnosed with IBS so I always have bowel movement immediately after I eat (especially in the morning), and have been suffering from painful menstrual cramps and frequent spotting which makes me feel dizzy from the lost of blood. 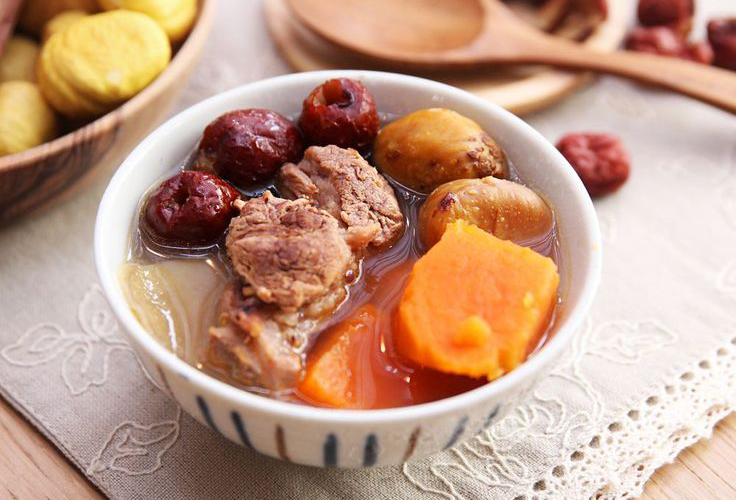 Does red dates with ginger soup help? Dear kay kay, we suggest you can try taking it a couple of times per week. 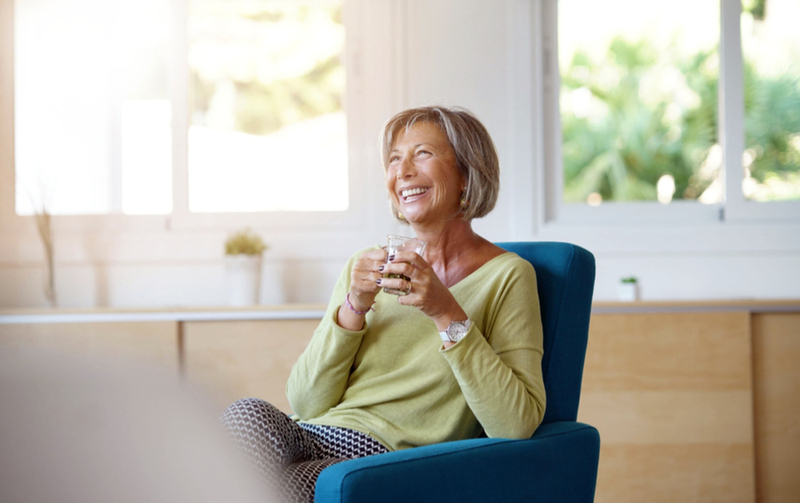 If your symptoms don’t improve after a month, then please consider visiting an experienced Chinese medicine practitioner for a consultation and diagnosis. Dear Connie, thanks for your question. If your main complaint is bad breath, this is a sign of a weakness with your stomach and digestive system. In this case, eating too many red dates would not help the problem if your stomach cannot fully digest them. We suggest consulting an experienced Chinese medicine practitioner. In our experience, you’ll need to pay attention to your digestion, bowel movements, oral health and the quality of your diet. I recently boiled red dates water using 65 pieces of small red dates. Is this too much for the body? Will there be any side effects? Thanks for your question Christine. We do think that 65 pieces is quite a lot! We hope you didn’t drink it all at once. Possible side effects of eating too many red dates could be stomach bloating, nausea and/or diarrhoea. If you experience any of these symptoms we suggest you reduce the amount you are eating. Dear Narelle, we suggest visiting a Chinese/Asian food grocer who may stock them. 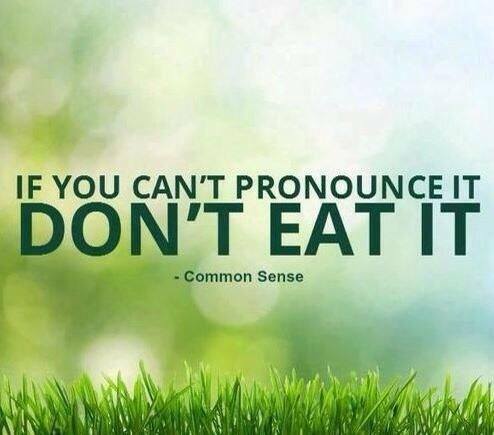 Otherwise you could also try a health food store. Recently only i knew about red dates and very curious about it. I am on medication for hyperthyroid. And also i have a week gum and teeth problem. So will it be ok or good to take 5dates per day? Dear Athifa, red dates may not be suitable for you if you have hyperthyroidism and experience painful gums due to excess heat. Overeating them could worsen your symptoms. Please consult with a Chinese medicine practitioner who can check your body and help you with your symptoms. I am scheduled to have an abdomen surgery on 10 Sep 16 but the recent blood test shows my haemoglobin level is too low (<9) for the surgery and doctor has postponed my operation. He asked me to take iron pills to boost up the HB level but I tend to have headache after the pill. Can you please kindly advise what should I take to increase my haemoglobin level? I prefer through diet instead of the pill as the pill make me sick. Do you think the beef bone + red date soup has good effect on this? Dear Faye, perhaps you can also try a lower dose of the iron? You can certainly have the beef bone and red date soup. A Chinese medicine practitioner can also prescribe you Qi and Blood Tonifying herbal medicine as well. Thanks for the chuckle! Laughter is the best medicine. I’ve heard that red dates boiled with celery and drink the tea are good for high blood pressure. My BP is VERY high, what do you think of this remedy or do you have other suggestion? 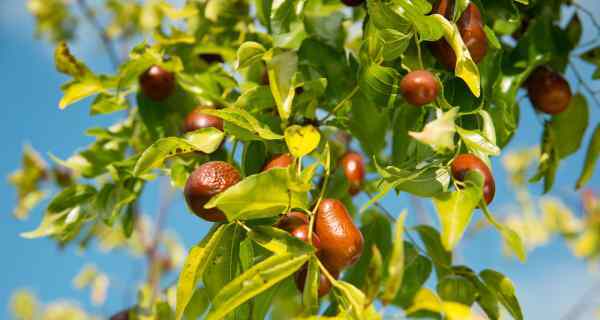 Dear Kanti, Chinese red dates are not helpful for high blood pressure and sometimes they can make the problem worse. Celery, tomato and watermelon juice however are beneficial to have. If your blood pressure is very high and not helped by your blood pressure medications, I suggest you to see an experienced Chinese medicine practitioner who can help you to diagnose and treat the underlying cause.